Recently, I received a sample of Walkers Mini-Festive Stars shortbread cookies. Walkers cookies are certified kosher, dairy. My kids had a play date last week and I put the cookies out for a snack and they devoured them instantly. They kept asking for more of the star cookies. The nice thing about them is that they are really small, so I didn’t feel like they would ruin their appetite. You could use them to decorate or dip them in jam. You could also use them to for Purim Mishloah Manot. They also offer Gluten Free Options. Purim is less than a month a way and I have been searching for different kinds of containers and ideas for Mishloah Manot. Here are some of the ideas I have come across for containers on Amazon. There are tons of deals. And Amazon can change their prices at any time, so the widget will provide the current pricing available. 100 16 oz. Clear PET Plastic Cold Cups & 100 Straw Slot Flat Lids. Great for Iced Coffee, Smoothies, Bubble/Boba Tea, Milkshakes & Frozen Cocktails. Proudly made in the USA with a BPA free plastic. Total Price: $5.79 for 24, 24 cents a box. You could have your kids decorate it with stickers. 1 Dozen Oriental Clear Frosted Takeout Boxes. Boxes Measure 2 1/4 Inches x 2 1/2 Inches x 2 1/4 Inches. Metal Handles Measure 2 1/4 Inches. Check out Tori Avery’s Woven Baskets. Check out these cute Cookie Baskets or this Paper Plate Crown. 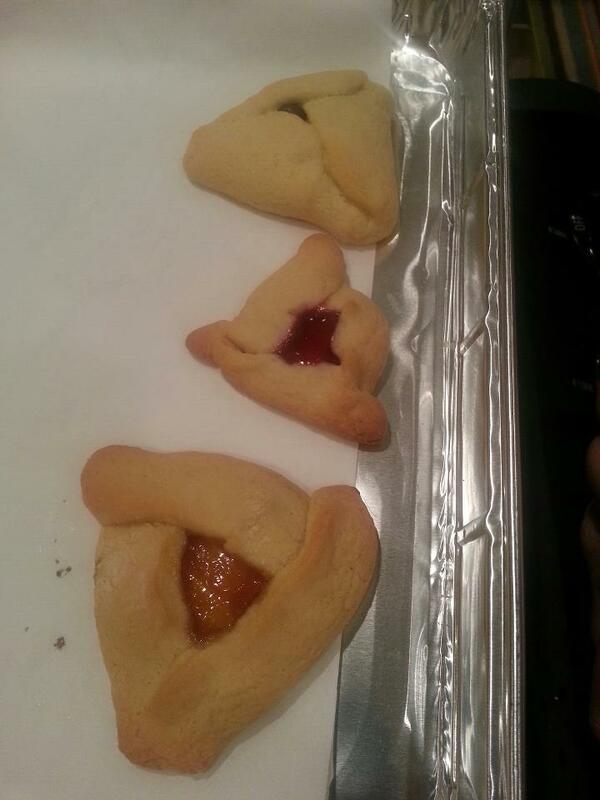 When I first learned how to make hamentaschen for Purim, I was taught to pinch the sides. But I found that for the most part the hamentaschen didn’t end up staying together. Last year in search for a recipe that might yield prettier hamentaschen I learned about a folding method. I have found that folding the hamentaschen actually makes prettier looking hamentaschen and if you don’t put too much filling they stay together much better.